After too many days of eating the white man’s food, I really was craving something Asian. I can’t go too many days without eating Asian food. I crave chocolates and sweets, but my want for Asian food runs deeper than simple desire. It’s like it’s ingrained into my genetic makeup to optimally thrive off of Asian food. With any other foods, sure I’m living, but who wants to just live? It probably didn’t help that I spent the whole day sweltering under the unforgiving sunshine of the desert to watch the BNP Paribas Open. When I’m stressed mentally or physically, I turn to food for comfort. That day was no exception, and I was happy to be out and about with Old Soul, who is definitely a food fan. He asked what I wanted to eat after our long day. I said “Asian” and he obliged. Simple as that. I don’t think I could be friends with anyone who would put up a big stink about what or where we ate. We really went to town on the ordering and the waitress laughed in disbelief when she confirmed our order of 6 dishes for 2 people. I’ve had chicken like this before and it was called Shan Dong chicken. Old Soul, being the unusually helpful China man that he is can read Chinese and the Chinese description of this dish, which was none other than Shan Dong chicken. This dish is quite popular here, but I was actually disappointed. The chicken wasn’t as flavorful as I’ve had before and the cold cucumbers nestled underneath the chicken wasn’t as marinated as I would have liked. You should have seen Old Soul turn his nose up at the site of those green cucumbers. He’s allergic to all things green apparently. Old Soul turned his nose at the cucumbers, but he had a look of horror when I pushed for an order of ong choy. I loved how the veggies weren’t sitting in a big puddle of its own juices. They must have been cooked at very very high heat. I could never get my vegetables this way at home. These guys are almost as ubiquitous as fried rice. Ok, maybe not, but I’ve definitely had my fair share of these carbo and oil laden delights. While very simple in concept, most of the time these things are either too oily, too dense, too heavy, or just plain average. 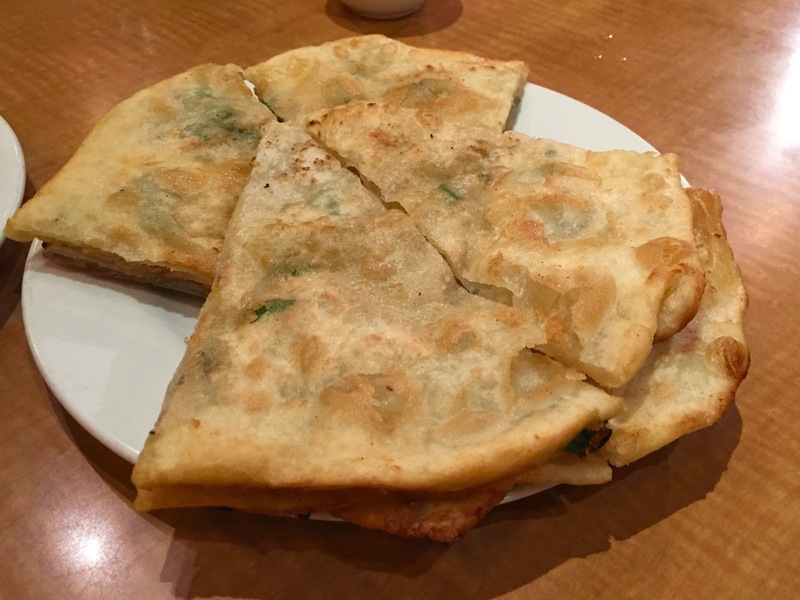 Well, I can say with full certainty that I’ve not had a scallion pancake as perfect as the one I had here in recent memory. I think I ate more of this than anything else that night. It was flakey, light, and crispy. You must order this. 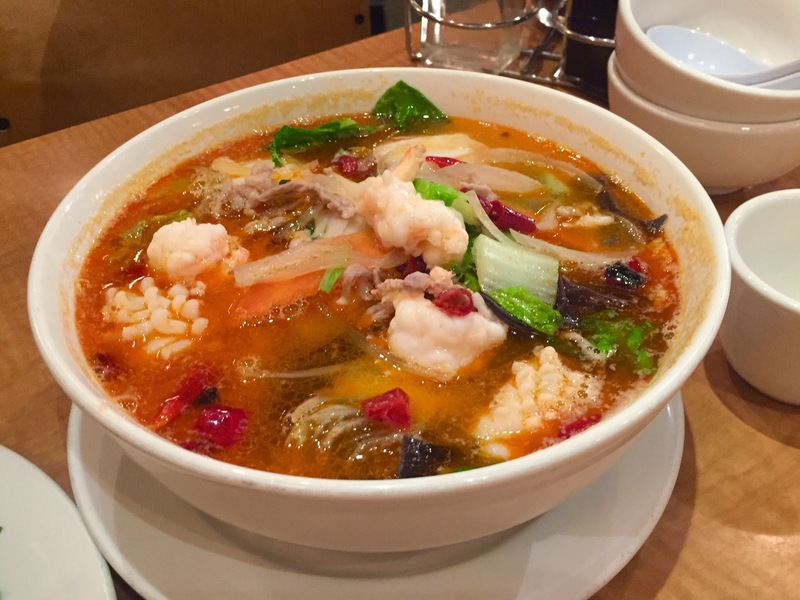 Normally with this type of Chinese food (dumplings, onion pancakes, etc), the accompanying noodle of choice is typically beef noodle soup (niu rou mien). I’m happy Old Soul had some opinions when it came to ordering because I probably would never have tried this dish otherwise. It packed a delightfully light yet flavorful seafood punch with a slight spicy kick. The seafood and veggies were plentiful. I ate most of the veggies and Old Soul ate most of the rest. 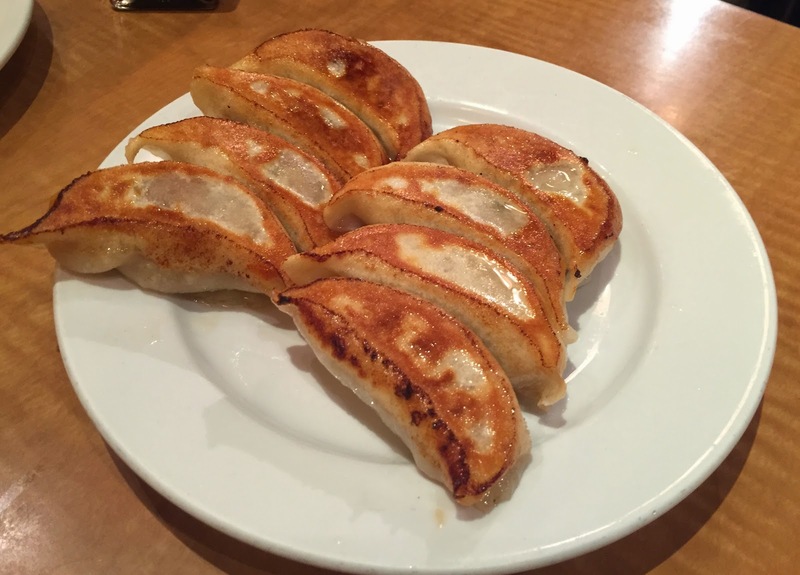 My favorite dumplings are probably Luscious Dumpling, but these were pretty darn tasty. They were so juicy and fresh tasting. I sorta wish I bought some frozen ones to take home. The crispy skin was nice, but these weren’t as juicy or interesting as the previous dumplings. It was a good balance to have one boiled and one fried dumpling though. So aside from the chicken, the rest of the food at Earthen was pretty darn solid. They are definitely doing things right here. The menu is fairly extensive including a lot of things that all the non Asians were ordering like kung pao chicken and what not. But I think its safe to say the dumplings and noodles are where its at. Rowland Heights isn’t too far a hike for me so I’ll probably find myself back here in the future. 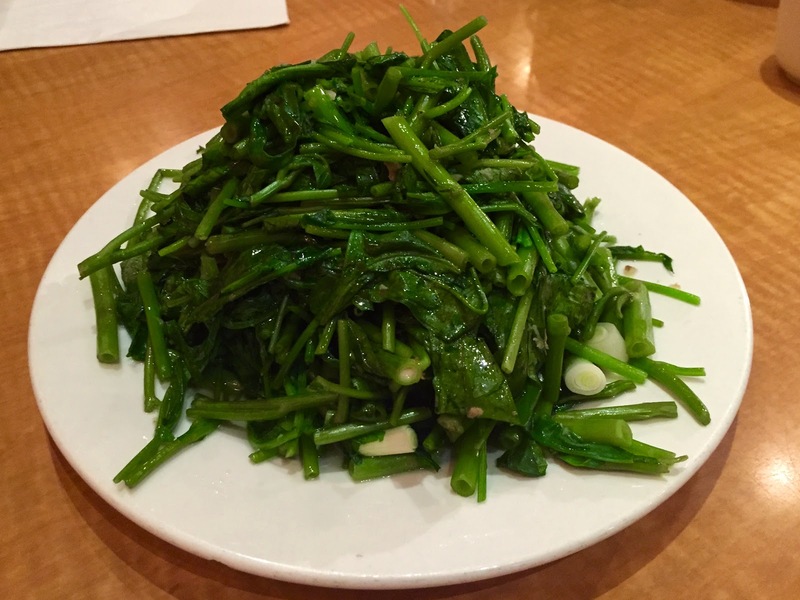 I’ll be sure to order one whole scallion pancake just for myself and a second one for the rest of the table. 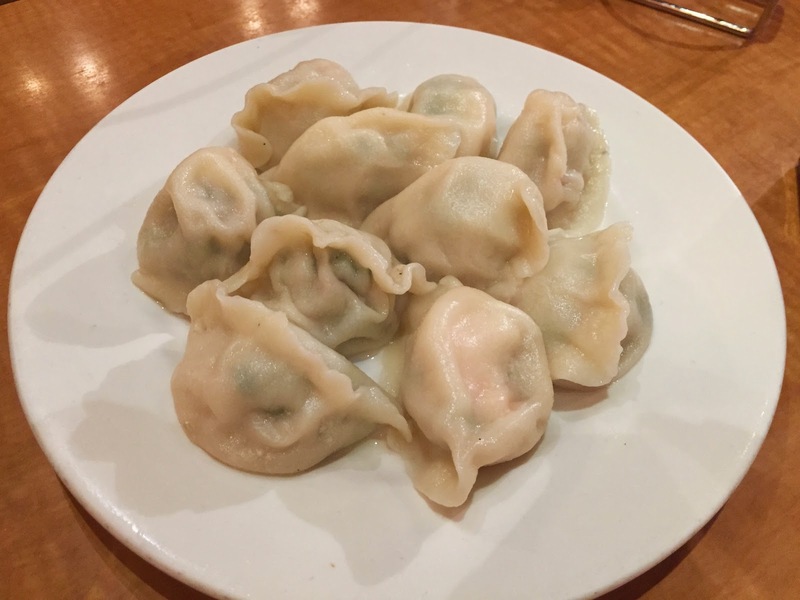 Old Soul would go with the pork and shrimp dumplings and definitely NOT the ong choy.